What is the opportunity and the challenge? 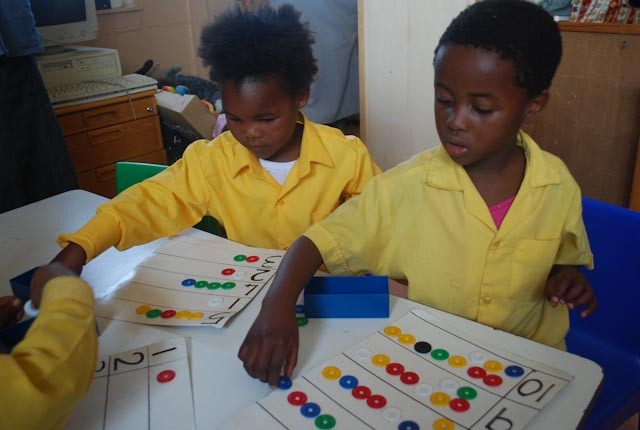 The Early Childhood Development (ECD) sector is at an important crossroads. For decades, NGOs in South Africa have been the main providers of ECD services to children under five. These organisations have worked in poor and isolated communities, providing training and support to ECD practitioners and caregivers, and as a result helping to support and develop children and the communities in which they grow and learn. Despite these great efforts, this provision has largely been dependent on the location of the NGO, and the somewhat limited reach that is possible when one has modest capacity and resources. It has often relied on an enterprising and committed individual who has seen the need and responded with energy and resourcefulness. It has also meant that over 1.5 million children (0-4 years) in South Africa have not had access to early care and learning opportunities because there has been insufficient support and an absence of a broader, unifying agenda for universal ECD. This is changing. 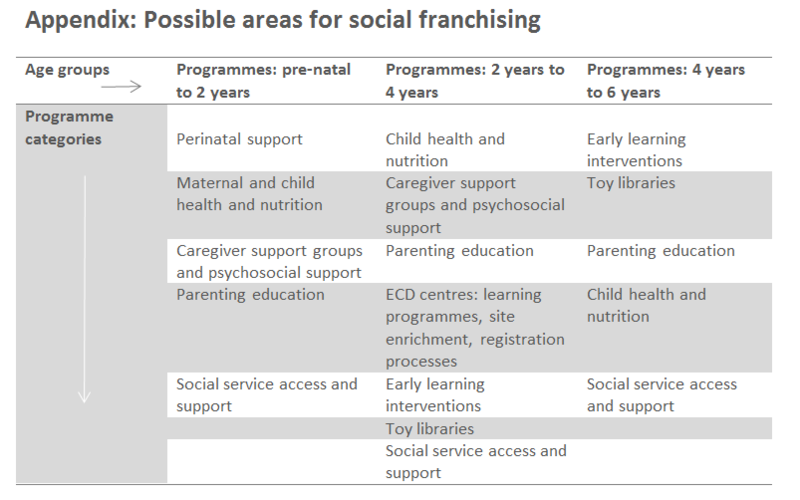 There is now political support for increasing access, and there is more and more scientific evidence that shows that investing in quality programmes in the early years has a lifetime of (positive) consequences for individuals and the wellbeing of society. Over the past three years, Government has more than doubled its allocation to early learning through per capita subsidies for children in ECD centres (excluding the extension of Grade R to over 80% of five year olds). The challenge is that we’re not geared for scale-up. The systems are not in place to implement an essential package of early childhood development services to every child in the country. Unlike the provision of schooling or health care, we don’t have the national scaffold in place to fund, train and support ECD practitioners in home-visiting programmes, community playgroups and early learning facilities. We need to start planning to develop every young child in every district in the country. This requires tried and tested programmes of learning and teaching, it requires that quality is benchmarked and assured, and that the public demand for these services is grown and developed. We know that organisations, specifically NGOs, working in this sector have invested a significant amount of time, intellectual capital and resources into designing, piloting, implementing and refining programmes for practitioner development, caregiver support and child development – across a variety of home, community and site-based settings. This amounts to a valuable repository of experience and know-how, and materials and resources that stands to benefit millions more children as well as benefiting from being part of a larger community of ideas and sharing. There are many ways in which we can respond to the opportunities and challenges of providing scaled-up ECD services. One way is to leave it to ‘others’ to decide what and how this gets done – government, entrepreneurs, private sector, new roleplayers. Another way is to bring what we have to the table, to share it, to use all the experience and influence and pride in what we have created to contribute to something that is bigger than our individual efforts. This certainly requires letting go. It also means that we gain access to a pool of ideas, thinking, and resources that will most likely enrich us as individual organisations but more importantly can contribute to innovation, affordability and access of services for young, and impoverished, children of South Africa. Ilifa Labantwana, and its donor partners (DGMT, ELMA Philanthropies and UBS Optimus), have been exploring the possibility of using social franchising to do just that – to increase access to quality ECD. It is a fairly new concept locally but experience in other parts of Africa and Latin America provide important lessons on what it can and can’t offer, particularly in the formal schooling system (see, for example, the Bridge International Academies in Kenya and the Omega Schools in Ghana). What we need to start imagining is a comprehensive and continuous service, across different modes of delivery and across different age groups. 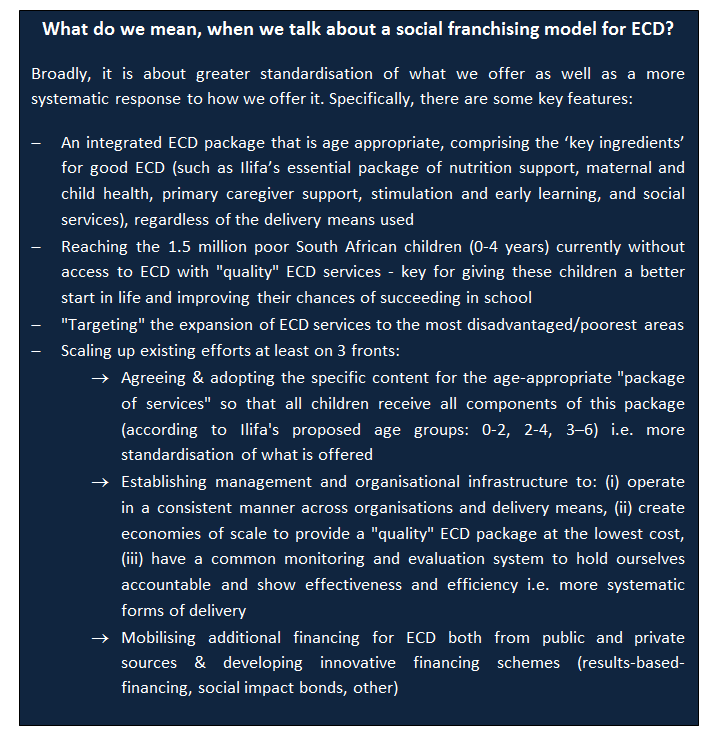 We are therefore seeking expressions of interest from organisations that wish to participate in a larger process of finding social franchising models for ECD replication and scale-up. For the first stage of this process, we are looking for organisations that are willing to contribute to a process of pooling information on their ‘package of service(s)’ in return for being able to use the full gamut of these services in a ‘social franchise’ under their own brand. Appendix A outlines the programme categories and services. The expression of interest should not be longer than 3-4 pages, and should include a written agreement to the pooling of information in return for being able to use all the pooled information in a ‘social franchise’ under your own brand. Please send me these blogs. Hi Kathryn -Thank you for your interest in our blog. Have a look, at the bottom of each of our blog articles are some text saying: Stay informed via email or RSS – just click on that to subscribe. It would be great if you could try to subscribe from an internet browser like Windows Explorer/Fire Fox – we have picked up a problem with this function when people are using Google Chrome and we are in the process of fixing that. I wish that I have ‘discovered’ this website earlier. I am busy with my research – transfer of learning from the College to the ECD workplace – and was googling ‘ECD resources and this is how I found the website. We are training almost 900 ECD practitioners – learnerships – in partnership with WCED and EPWP. It is exciting to be part of this process of uplifting ECD in SA. Glad you are finding useful information on the website, Wilma. Also have a look at our Confluence of Ideas and Practice website where we feature the work and implementation experience of our current and former grantees – we have a whole section on ECD there (http://www.dgmt-community.co.za/). You should definitely also look at one of the largest ECD projects that we support, Ilifa Labantwana (http://www.ilifalabantwana.co.za/) and link up to their network.